We think of our life as starting at birth and ending in the grave – or the fire. But basically our life is part of an endless cycle: every particle in our body has been part of billions of bodies, maybe plants, maybe animals, maybe humans – and will cycle through millions of living bodies after us. Thinking of this we can feel connected with nature in many ways. Best known are the cycles of water, carbon, sulfur and phosphor. Water has a complicated cycle, in short: evaporating from the ocean, raining on the land and returning to sea by way of rivers. But living organisms are part of the cycle: no living being can exist without water. Three quarters to over 90% of every organism is water. And water is broken down and rebuilt in the process of photosynthesis and metabolism in living cells. 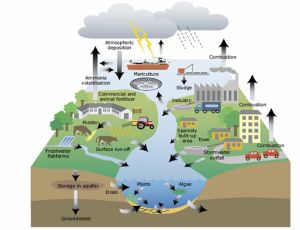 In this way, we – and every animal and plant – is part of the natural water cycle. In the modern world many different chemicals can enter the water cycle; for clean drinking water a purification process has to be part of the cycle. This can be done by deep soil, (groundwater is mostly clean, good for drinking) or evaporation (rainwater tends to be clean too). But in urban, industrial areas filtering systems are often necessary. Like water also carbon is cycling through every living organism: plants take it from the air, store it in organic molecules, which are often eaten by animals – all animals live on plants, direct or indirect. Part of this cycle moves fast, but part of the carbon is stored underground, becoming fossils – or fossil fuels… This part of the cycle lasts hunderds of millions of years – only now humans are shortcutting this cycle by buring fossil fuels and bringing carbon back in the atmosphere much sooner: we use every year the carbon that once was stored in about a million years. Nitrogen, the most abundant element in the atmosphere (nearly 80%), is essential to all life. It is necessary for most biological processes, and a critical component of DNA and RNA, important for genetic information and activities in every cell, and part of every protein, the working molecules in cells. The Nitrogen in the earth’s atmosphere is not in a form plants can use. It must be converted from its gaseous form (N2) (“fixed”) into compounds such as nitrates be utilized by living organisms. The amount of fixed nitrogen determines how much food can be grown in a soil, so it is —along with other nutrients—critical in food production. Nitrogen also ‘moves’ in cycles, both biological and geological. Bacteria can fix free nitrogen and make it available to plants, but lightning can burn nitrogen to oxide, which turn into nitrates, and volcanoes can bring a lot of N-oxides in the air. Lack of nitrogen in the soil makes it less fertile, too much nitrogen falling down in the rain is pollution and makes the land less fit for natural ecosystems: less wild flowers and more ‘weeds’. 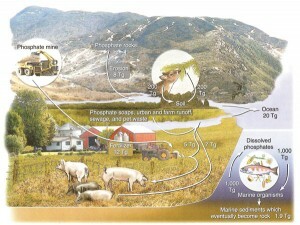 Phosphorous (P) is an essential nutrient for plants and animals, but is not very common in the biosphere. This nutrient is found in soil and rock, but does not in the atmosphere. Geologic processes bring phosphorous-laden ocean sediments to land, and weathering spreads them throughout the terrestrial environment. Plants absorb the phosphates from the soil and turn them into organic compounds which go into the food chain. Decayed plant and animal matter return phosphates to the soil or to rock, and weathering also returns them to the ocean. 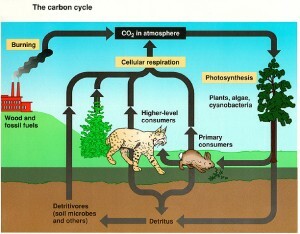 The phosphorous cycle is one of the slowest of the biogeochemical cycles. Because phosphorus is not so general available, it is an important part of fertilizer. Places on earth where phosphoroues is being mined are often places where millions of seabirds (recent or in ‘fossil’ times) have left their droppings (guano). P is a non-renewable resource and is estimated to be depleted in 50–100 years. It is essential to food production and thus to food security in the future. As the production will be more and more expensive, food for people will be more expensive too.Yet future access to phosphorus receives little or no international attention. Keeping the natural cycle going is there fore essential for feeding the world. Sulfur (S) is an important component of proteins and enzymes in plants and animals. Most of the earth’s sulfur is found in ocean sediments or volcanoes. It is also found in the atmosphere as a result of evaporation, organism decay, volcanic eruptions, and as a product of industrial processes. It is part of ‘acid rain’. 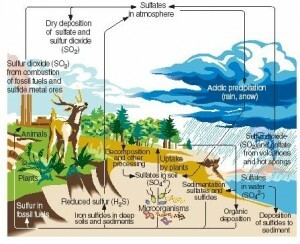 Sulfur returns to the earth as particulate matter or acid deposition to be absorbed by plants and returned to the cycle. Sulfur is important in our food, you get it in dairy products, seafood and many vegetables. Every living being is taking up stuff from and giving stuff back to its environment. As soon as this stops life stops (except things like seeds, that can stay alive without any activity for a long time). Every living being is part of many cycles! In nature waste does not exist! Human beings are no exception, we need oxygen, food and water to stay alive. Until recently there was no big problem, human waste was mostly organic, and returning to natural cycles. What went wrong? We broke the cycles! But slowly we became more and more numerous. We learned to make materials that cannot be recycled easily. We started dumping waste in great landfills or straightaway in the sea, which broke the cycle too. 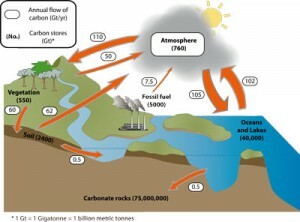 And we burn more and more fossil fuels bringing carbon back in the environment thousands times faster than nature does. In many countries much of the waste is being recycled: glass, paper, metals, plastics etc are collected seperately, and sent to the factory to be reused, or the stuff is seperated afterwards and sold to the industry. 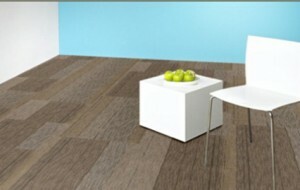 But: the problem is that the recycled products do not have the quality of the new. When newspapers are made from old paper, rests from ink, containing heavy metals, and chlorid (used for bleaching), turn up in the environment and poison the water. Old plastic is used for low-quality products. It is not recycling, but ‘downcycling’… In the end there is still waste. 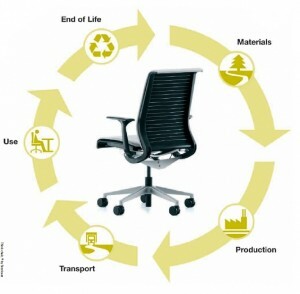 In the cradle-to-cradle model, all materials used in industrial or commercial processes—such as metals, fibers, dyes – are seen as ‘technical or biological nutrients’. Technical nutrients must be strictly limited to non-toxic, non-harmful synthetic materials that have no negative effects on the natural environment; they can be used in continuous cycles as the same product without losing their integrity or quality. In this manner these materials can be used over and over again instead of being ‘downcycled’ into lesser products. Biological Nutrients are organic materials that, once used, can be disposed of in any natural environment and decompose into the soil, providing food for small life forms without affecting the natural environment. This is dependent on the ecology; for example, too much organic material in fresh water can cause death for all organisms in that water by using all the oxygen. Many human beings come into contact with or consume, directly or indirectly, many harmful materials and chemicals. 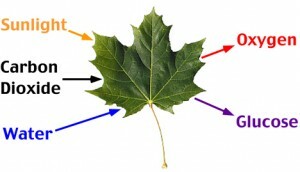 Other forms of plant and animal life are also exposed to chemicals with unknown consequenses. The cradle-to-cradle project seeks to remove dangerous technical nutrients (synthetic materials such as mutagenic materials, heavy metals and other dangerous chemicals) from life cycles. If the materials we come into contact with and are exposed to on a daily basis are not toxic and do not have long term health effects, then the health of people and nature will be better. For example, a fabric factory can eliminate all harmful technical nutrients by carefully reconsidering what chemicals they use in their dyes to achieve the colours they need and attempt to do so with fewer base chemicals. The cradle-to-cradle-project is directed on industry, but for a sustainable world it is necessary that schools take over the idea and make ‘cycling’ the basic idea of our thinking. If we educate the young for ‘sustainable development’ it should become normal to think of the recycling possibilities of the things one buys. Educational research can tell us a lot of how to make use of education for sustainable development for child development. The most important fact might be that ESD is an excellent frame for the empowerment of children. When we respect each individual child for its ideas and opinion, and at the same time bring the child into challenging learning situations we facilitate empowerment of the child. Developing self esteem and empowerment goes hand in hand in education for sustainable development. A proper self esteem is an important part of successful child development. Another important fact is that ESD is a productive frame for meaningful learning. Opposite to rote learning and the acquisition of facts without much understanding meaningful learning situations help the child to engage fully in the teaching. By working with real problems the child can develop much better understanding of concepts and skills from the school’s curriculum in a meaningful context. The key to that is the opportunity to use and reflect on these ‘traditional’ ingredients of classic schooling in the meaningful contexts derived from the focus on sustainable development. Similarly some schools have put a lot of emphasis in making the school buildings more ‘green’ with solar power panels, recycling systems, water conservation measures and tree planting around the school. Again, such initiatives are only valuable for the learning of the students if they are planned as student projects. – How can we challenge students’ thinking on the future and how to make use of parts of the curriculum in a meaningful way in combination with this challenge? – How can we teachers cooperate to create stimulating activities and plan the teaching in such a way that the self-esteem of the students will benefit from it? – How can we help students to investigate local people’s concern for the future and how to make sense of such results? – How can we help students to try to make a difference according to their wishes and visions? Education is not a ‘magic bullet’ in approaching sustainability (climate change, pollution, scarcity of water and other resources, etc) , but without co-ordinated educational interventions, even the best ideas through technical policies will fail. In order to promote such a reorientation the International Alliance of Leading Education Institutes has agreed on eight recommendations, informed by the jointly conducted research project and targeted the world’s political decision makers. – Schools will play a critical role, through what they teach and how they model sustainable practices. – Whole-school approaches are promising: societies need to re-orient schooling towards a stronger emphasis on education for sustainability. In practical terms, this means interdisciplinary work, participation in sustainability challenges and interaction with others outside school. – One of the key obstacles to Education for Sustainable Development is teacher knowledge and understanding. – Teacher education in ESD will not change school practice unless resources and time for experimentation are provided and the sustainability is integrated into the curriculum. – Interaction between researchers, teachers, NGOs, public officers and others in the field of Education for Sustainable Development is essential, in order to support knowledge sharing, enhance curriculum development and promote more valid and reliable ways of evaluating ESD. buying is a political activity. When you know the consequences of your behavior you may behave more responsible. Have you ever been to the mall? There are so many things in there, like clothes, food, medicine, etc. Maybe your parents give you permission to choose your own clothes or other goods. Did you ever think where the things come from? Maybe not, but you must know that many of the things that we use or eat have traveled long distances until we buy it. And: Did you think of where your things go, when you do not need them anymore? What you buy or consume makes your footprint in the earth, partly nearby and partly far away perhaps on the other side of the Earth. And what you throw away can make your footprint even bigger. By choosing certain goods, we can support natural conservation, or give poor people some income, or the opposite: we can support the people who damage the environment, or make the producer even richer. 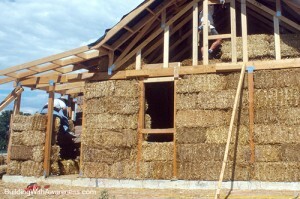 You can use materials that can return to the natural cycle – or not. What you buy or not buy can make a difference for the world. Do you want every cent of your money you spend to be useful? Or do you care who benefits from your money? When you buy something that is cheap, it often is expensive somewhere else or for somebody else. Assignment 1: What is environment friendly, and what not? Divide the group of students in groups of 3 or 4. Each group is asked to buy 2 kinds of goods (of the same type so you can compare): 1 representative good that is environment friendly, and the other the opposite. a. Why do you think that the thing that you choose is environmental friendly and the other one not? b. What is the difference between the two things you bought? c. Present both products to the class explaining why the one is environmentally good ant the other not. Make clear that one can make a choice for more sustainable shopping. Assignment 2: Where do my things come from? Make a list of 10 things that everybody uses: some kinds of food, clothes and shoes, things for the bathroom, like soap or toothpaste, technical products (perhaps a radio or mobile telephone) etc. Each group goes to the shops where you can buy these things and try to find out where the things have been produced. (Perhaps different parts of the products come from different countries! Make a big map of the world*), hang it in the classroom and draw a sign on every country where one or more of your products have been made. The map will show you where your ‘footprint’ is. Assignement 3 : How does this return to the cycle? Try to find out, what happens with the thing, or the parts, when it is thrown away: can it be broken down in a natural way? Can it be re-used? In the same form or differently? And is it CAN be re-used, will that happen also? Try to design the same or a similar thing that can be really ‘cradle tot cradle”, that can be used as a valuable product, or return to the natural cycles completely.